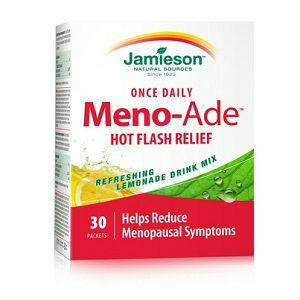 Taken only once daily, Meno-Ade provides women with all-day relief from menopausal symptoms. A great-tasting lemonade beverage that is clinically proven to reduce the severity and frequency of hot flashes and night sweats. Formulated with geniVida®, a proprietary pure soy-free ingredient which delivers the optimum level of genistein – an isoflavone which research has shown is the central factor in providing menopausal relief. Excipients: Natural Lemonade Flavour, Citric Acid, Maltodextrin, Malic Acid, Sucralose, Silica – ingredient amounts for excipients not provided in the product source. Mix 1 packet in 500 ml of water. Take 1 packet daily. Take a few hours before or after other medications or health care products. No product price information could be located in the product source even though all source links were checked. Given the limited amount of information available in the product source on price and on product warranties and returns it is difficult to reach a conclusion about this product. Anyone interested in purchasing this product may want to contact the vendor directly since the product source does contain a contact number. Jackie Horowitz	reviewed Meno-Ade	on October 8th	 and gave it a rating of 2.